Wednesday, October 24, 2018, Boston – Insilico Medicine, a Rockville-based company developing the end-to-end drug discovery pipeline utilizing the next generation artificial intelligence, will present its latest results in modern and next-generation AI for biology and chemistry at the AI in Healthcare Conference in Boston, 26 of October. Artificial Intelligence (AI) techniques, such as deep learning (DL), reinforcement learning (RL), and generative adversarial networks (GANs) play a pivotal role in studying the biology of aging on many levels. The presentation will focus on the development of multi-modal predictors of age that use a variety of data types, ranging from blood tests to microbiomic and synthetic data, in order to give the most accurate, true biological age of the patient and identify actionable targets and pathways. "We are happy to present our work at the AI in Healthcare Conference, which gathers the key industry leaders. 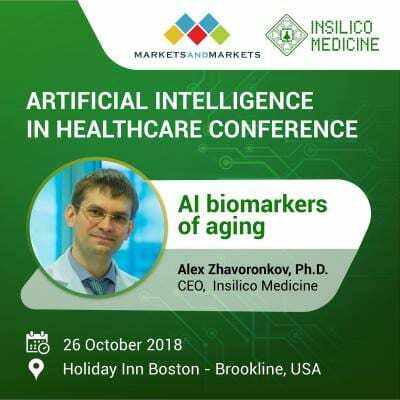 The topic of aging biomarkers is rapidly gaining popularity, and we are happy to be at the leading edge of research and one of the innovation drivers in the area", says Alex Zhavoronkov, Ph.D., Founder, and CEO of Insilico Medicine, Inc.
AI in Healthcare brings together all the entities from the healthcare domain to discuss the objectives of Artificial Intelligence and learn first-hand experience from the experts, developing the technology. The Conference is held on 25-26 of October. For the audience, interested in the applications of AI to medicinal chemistry, Prof. Zhavoronkov will be presenting at another conference in Boston during the same dates, AI Applications Summit, 25-26 of October.